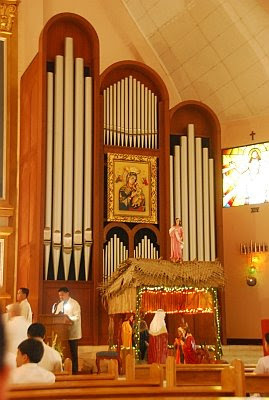 A favorite church of the well-heeled for weddings, baptism and other events, tucked in an gated community of Greenmeadows subdivion in Quezon, very near Eastwood City, Libis, is the Christ The King Parish. Tutubi attended a wedding there last year but only remembered to post it here due to the recent sad news about the demise of Francis Magalona, more popularly known as Francis M., a gifted artist, nationalist, and composer who died today after a few months fight with leukenia. Tutubi received the news from his officemates who's a friend of Maxene Magalona, one of Francis' eight children. The wake of Francis Magalona will be held at the chapel of Christ the King Church, that's why he posted information on how to get there. Note that there's limited parking space inside the compound but probably you can park on the street. Commuting to the church is not easy for no public transport pass by the exclusive subdivision. for Driving directions, it's in Greenmeadows, near Ortigas Avenue. The closest you can get there by public tranport are the Rosario-bound jeepneys from Robinsons Galleria or Rizal-bound jeepneys from EDSA Central but you need to walk quite a distance from C5 if you can't flag a taxi. Directions from Greenhills, drive towards EDSA on Ortigas Avenue then turn left on Greenmeadows, the traffic light after Lanuza and before you reach C5 (tiendesitas). It's about a kilometer from there. From UP via C5, drive past Eastwood City, Libis and turn right when you see Jollibee where you'll see the church about 500 meters from the corner of C5. I've attended a baptism here two years ago :) They don't charge huge fees for baptism unlike the church in Rosario which charges P1,000 per sponsor. nina, yeah, some churches are like that. mllk money out of sponsors as if it matters...sad. 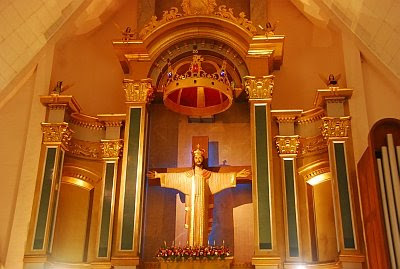 therefore, the parish church of Eastwood City is Christ the King in Greenmeadows, right? Of course, there's a chapel inside Eastwood City but that's not a parish church. We might be moving to Eastwood City soon so I'm trying to find out under what parish shall we be? I'll be happy to hear from you. what time is the midnight mass? Hello... may i ask the schedule of masses 4 today?asap. thanks. Hello! I am a Christ the King devotee and I am willing to render my services. Are you accepting volunteers? Do you have ongoing or scheduled seminars on how to become a mass lector or of any kind? What are your requirements? Thanks. Hope to hear from you soon. Do you know the detailed history of Christ the King?